Time for another giveaway as part of our Two Year Anniversary Giveaway. 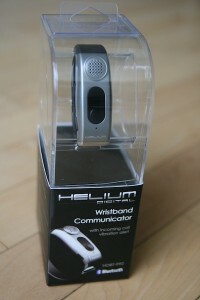 Today’s prizes are courtesy of Helium Digital, a Canadian company behind products like the HDBT-990 Wrist Communicator, and Gel-Shellz for iPhone. These are the exact products that are being given away today! The HDBT-990 Bluetooth Wrist Communicator was reviewed by us and is a unique accessory to have when you’re in quieter environments that don’t warrant a BT headset. We were the first site in the world to review this unit. You can feel like James Bond when you speak into your wrist. We’re giving this away today! The Gel-Shellz are silicone cases for your iPhone 3G/3GS that are well made and include a cut out on the back to reveal the Apple logo. Two of these are up for grabs. 1. Post a sentence below with the words “Helium” and “Digital” (but NOT beside each other). 2. Contest ends on March 1st, 2010 at 11:59PM. Open to Canadian addresses only please. Please contact us so we can email you the promo codes! L5 Remote, for iPhone Coming Soon!